I'm creating this as a general topic for Radios. Share your setups if you have one, share your handles, where you're at, etc. This way I can stop creating a new topic every time I want to share something. So the other night I gave a friend a laptop power cord and an old busted laptop to use for parts, and in exchange he gave me a bunch of spare stuff for CB radios, 3 old radios, a bunch of mics that needed plugs, etc. 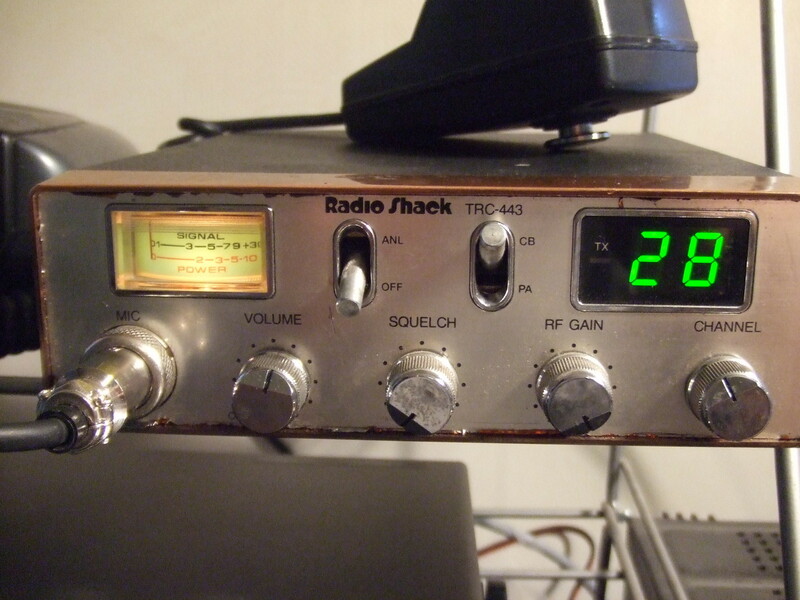 In the pile was this old Radio Shack TRC-443 radio. It worked, but only if I flexed the back of the radio, so I figured there was some loose solder somewhere. I touched up the solder from the antenna plug just to check, but that wasn't it. After touching and wiggling parts for about 10 minutes, I figured out it was the RF1 final in the middle of the board. I just touched up the old solder and pushed it back into position to make good contact, and now this old thing is running like a champ on my spare/test antenna (A 36" Lil' Wil' whip stuck on the roof). It's even picking up skip from Mexico and stuff. I plan on using it as a "test" radio to test mics and for monitoring a channel other than the one I'm actually talking on with my big radio. People know to look for me on 10 because that's usually where I go to talk to friends and family so I don't take up space on other channels, but I also spend a lot of time on channel 3 talking to the local CBers. Now I can use my big radio to talk on 3, and use the little one here to monitor 10. This one is a "Realistic" (AKA Radio Shack I think) 40 channel radio, and although it looks pretty rough, it actually works just fine. I just need to get an adapter to change it over from a 5 pin mic plug to a 4 pin one cause' the 5 pin plugs are pretty much outdated and a pain to re-wire, and that's assuming I even had a 5 pin mic. I took it apart and crossed over the pins on the back of the plug to make sure the radio worked, I just don't have any mics to fit it. 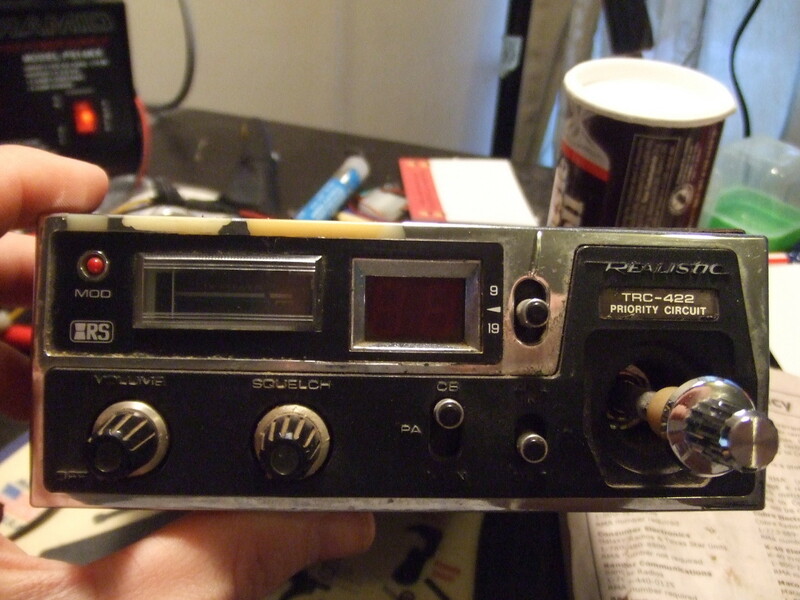 It looks as though at some point somebody lost the proper channel selector knob and just jammed one on there for the time being, so it kind of looks like the Frankenstein radio. Obvious question comes to mind: Isnt there something illegal about this? I don't own any CB radios, but I do have a FT-950 and FT-450. Nope. The only thing that's technically illegal would be if I modified them to output more power than is allowed by the FCC (I haven't), unless I was preparing them for export to a country where they can legally transmit at more than 4 watts. Also it's illegal for me to operate a "HAM" radio, since I'm not a licensed operator, but these aren't HAMs, they're CB (Citizens Band), and although they can use some of the same stuff like mics, coax, and antennas, these operate at lower power and on different frequencies. CBs are not regulated though as far as "who" can operate them unless the FCC has formally informed you that you can't have one any more, or confiscated your equipment for violating other sections of their regs. Yep, the radios I have you have to have a license to operate. There's a few guys around here who are amateur/HAM operators, and just tune into the 11 meter band at night to talk to us here locally on CBs using their HAM radios, and I've heard them mention Yaesu radios and speak very highly of them. I don't know much about them since I'm just a CBer, and am kind of new to that myself. That thing, even compared to my Cobra 148, makes me feel like a kid who has been playing NES for years and years and just got handed a PS4 controller, lol. There's a LOT of stuff on there, but I guess that is to accommodate the fact that it will operate on several different bands. Yeah when I first set mine up, being new to CB radios, even though there's quite a bit of distance between me and the neighbors, I wasn't sure if it would interfere or not, so I called them and had them flip through TV channels to make sure my antenna wasn't too close and messing with their televisions, albeit it doesn't take much. I have another Cobra 148 GTL in my pickup, and was sitting in a church parking lot one day and hollered at my mom to ask her a question, and when I came back in they told me that I overpowered the PA system. They couldn't understand me, but they heard me. That radio is a stock radio as well, only doing 4 watts + modulation, so I guess it really just depends on how sensitive the stuff around you is. I don't usually have much luck talking skip, probably because I'm not running any power, but I can hear everybody and their cousin from all over the States, Puerto Rico, Canada, Mexico, etc. Here's a topic with one of the videos in it. It's pretty easy to get your technician's license. It will open up a whole new world. Try to locate a local amateur radio club and check it out. There is a huge difference in CB and Ham Radio. I enjoy my ham radio alot! I'm getting flashbacks to the early 80s. Is this kind of thing still popular? Around here there's tons of people that have them, but I think it really just depends on where you live. I'm in a rural part of the mountains of eastern Kentucky. When I lived in Washington(state not D.C.) I had one in my car and there were still quite a lot of people on the air, but it was harder to find radios and accessories because places like Radio Shack didn't sell them (Although the one here sells all sorts of stuff for them, again I guess it's just supply/demand), so for people who were just curious and wanting to experiment, it was a little harder to get started. Even if the people around here don't talk on them every evening like I do, if you just pay attention to the cars, about 50% of people have one installed in their vehicles, not just for personal communication, but because a lot of the coal mines require you to have one in your vehicle, that way if you're about to get run over by one of those trucks the size of a building you can holler and let the driver know to stop. I don't know how "many" people around the world still run them, but during daylight hours you almost "have" to have some kind of illegal power to get over top of the noise of everybody skipping in. Skip, aka DX, is just RF waves bouncing off the upper atmosphere or cloud cover. Sunlight makes it way worse which is why it's most noticeable during the day. At night I've talked 60+ miles out, but during the daytime I hear people from all over the world, and I do good to cover this county, let alone reach into Virginia, until the sun goes down. Most truck drivers have them in the U.S. too, for reasons similar to the coal miners. They keep tabs on road conditions and weigh stations sometimes use them to give instructions to truck drivers, etc. There's been more than one occasion that I've used the one in my pickup to see what was going on and get directions to a detour from a truck driver who knew more about the area than I did. 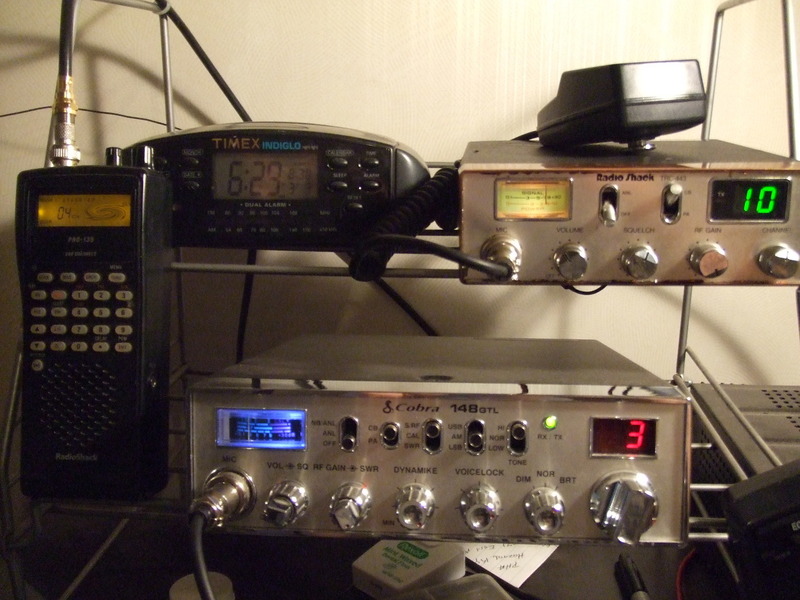 No CBs anymore, but I own an FT-8800 (mobile), an FT-897 (base), and a VX-6R (HT). Anyone considering getting their license, should The Technician is super simple to get and very rewarding. Still sorting through the huge pile of stuff I got from this guy, and have a question about this power supply. If anybody knows how to work on these things and can help me out I'd appreciate it. Any decent amateur/HAM radio base station with a good antenna could cover that distance easily. My base CB radio, which outputs at much lower power than a HAM/Amateur radio, covers 2-3 times that distance in mountainous country. You'd just have to get yourself a good antenna and stick it up in the air enough to get it above any nearby obstructions such as buildings, trees, etc. If you're interested in becoming a HAM, here's some reading material to get started. Just hit up YouTube and learn all you can learn. Learn about things like standing wave, how coax and antenna length can affect how well you transmit/receive on different frequencies, proper lingo and practices for establishing communications, etc. There's tons of things I could mention but I'd be here forever. The information here largely pertains to the U.S. since it references the FCC, but a lot of other countries have reserved the same frequencies for similar uses. That's why sometimes here in the states, when conditions are right, we can talk to people in Europe using CB/HAM radios, because they operate on the same frequencies. Here's something I found with a quick Google search to help you get started. Man, back in the early 90's I had a few cb's. One was the Cobra 143. The other was a SSB french brand I paid $350 for. I had a Texas Star 350 watt amp. I could stand beside my vehicle with a 4' fluorescent bulb in my hand and key the mic and the bulb would light up. I lived in Florida and on good nights I could talk skip to folks in West Texas using especially if the sunspot cycles were low. Fun times! Break one nine. Just replaced the mic plug on this other radio I got from the same guy in trade for an old busted up laptop I had. Did a video overview of it. So Redman CBs was issued a citation the other day for knowingly selling non FCC approved linear amplifiers, and marketing them for use on the 11 meter band which itself is illegal. Since then, both him and Fatboy's website have removed all linears from their websites. If you've ever bought one of these things for "academic" purposes from Redman or Fatboy, you may be getting a knock at your door from the FCC. Managed to make contact with a man in Northern Ireland on single side band today. It was really hard to make him out over the noise, but I managed to get his first name, call sign, and location. I have a video of the conversation uploading to YouTube, but it'll take a while. Anybody on here from Ireland use a CB/HAM radio? Skip is a strange thing, it's unpredictable. At night when the sun goes down I'm lucky to reach 100 miles in this mountainous terrain, but during the daytime when the sun's rays are hitting the atmosphere, or when we've got cloud cover, radio waves bounce around like rubber balls and it's untelling who you'll hear, or how long you'll be able to hear them for. I keep a little log book of people I make contact with, just because I find it kind of interesting. Have made some interesting contacts the past couple days. The cloud cover I guess has had skip rolling pretty good in my favor. I've been hanging out on 38 LSB (Lower Side Band) mostly because AM is just too much of a mess to really pull anybody out. The one with ?? I was hesitant to add since I had no name or DX number, but I heard them call out my DX number and location very clearly, as well as their own location, and then they faded out. Since I knew they had heard me I just wrote down what state they were in since that was all I could pull out of the noise.